For the second year in a row, two College of Business and Economics students represented Towson University at the National Collegiate Sales Competition (NCSC), which took place earlier this spring. LeeAnn Goodrich and Jordan Arian-Nejad competed in the role-playing and speed selling competitions, respectively, along with more than 400 students from 80 institutions across the country. 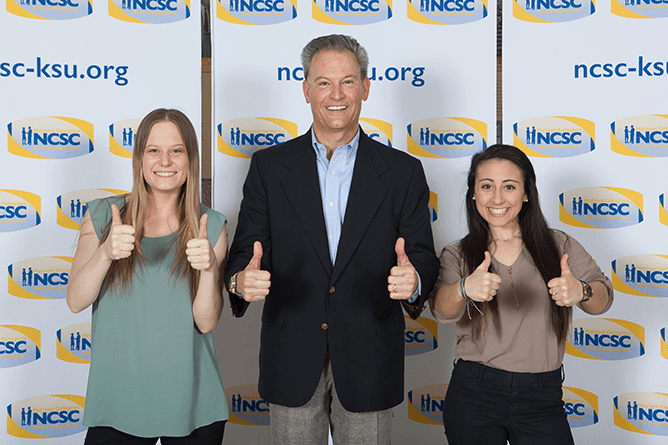 Founded in 1999 to promote and enhance the practice and professionalism of sales, the NCSC is the longest-running role-play sales competition for university students in existence. In the role-playing competition, individuals prepare and deliver 20-minute mock sales meetings, playing the part of a salesperson presenting a product to a representative from a fictional company. Students were judged on their approach to the client, needs identification, presentation, overcoming objections and close. Both Goodrich and Arian-Nejad said it was an incredible learning experience. Goodrich said it boosted her confidence, too. In addition to building their skills, the students also got to network with employers and sponsors. For Arian-Nejad, it solidified her post-graduation plans. “Not only did this experience validate my passion to pursue a career in sales, but it also excited me for the opportunities to come,” she said. Both TU students qualified to attend the NCSC after competing in the fourth annual CBE Sales Competition last October. The CBE Sales Competition is open to students of all majors, and no experience or previous interest in sales are required. This year’s competition will take place Oct. 25. In addition to the opportunity to network with judges and buyers looking to hire, students can compete for scholarship prizes.